Today Opera Software released new versions of both its mobile browsers. Opera Mini 6.1 is now available at m.opera.com for Java, Symbian (2nd edition and later) and BlackBerry (OS 4.2.1 and later) devices and in the Android Market for Android 1.5 and later. 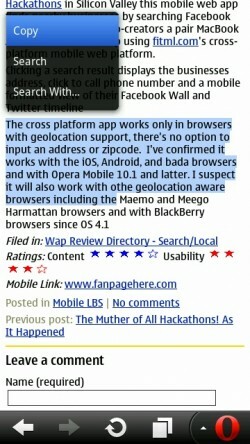 Opera Mobile 11.1 is available from the same locations for Symbian (3rd edition and later) and Android 1.6 and later. My favorite improvement in both Opera Mini and Opera Mobile is with the way text selection for copying from a web page on touch devices is handled. You can now move and resize the selection using grab handles (image above, left). When you get the selection right you tap an onscreen “Select” button to display the selection context menu (image above, right). This is similar to the way selection is handled in the iOS and Android Gingerbread browsers and huge improvement over the way it worked in previous Opera versions where you esentially had only once chance to get selection right. Search auto complete. As you type in the Opera Mini search box, suggested completions for your query appear in a list below. Tapping a suggestion immediately executes the search. Search completion works with the default Opera search provider, Yandex in Russia and Google elsewhere. Search directly from the address bar. If you type something that’s not a URL like “octopus”, Opera will suggest “search for octopus”. Improved URL auto completion with better support for country level TLDs like .co.uk and .ca. There are many other new features and bug fixes in both Opera browsers. The Opera Mini and Opera Mobile Blogs have comprehensive platform by platform change ists. A word of warning for Cyanogenmod 7 ROM users. There are multiple reports Opera Mini 6.1 using a very ugly mono-spaced font with CM7. Opera is aware of the issue so a fix is hopefully forthcoming. 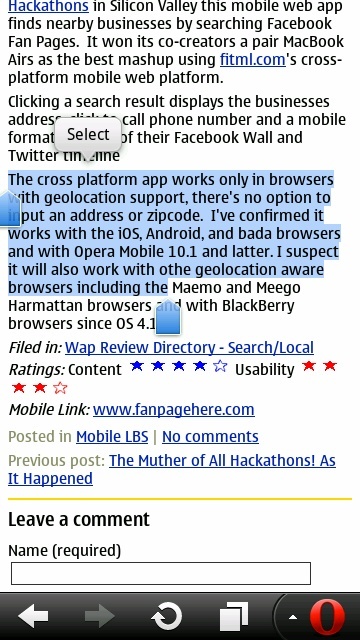 As far as I know this only affects CM7. I have no font issues with Opera Mini 6.1 on my HTC Magic running Cyanogenmod 5.0.8. If you’re running CM7 you probably want to either hold off updating until a fix is released or at least backup your copy of Opera Mini 6.0 before updating so you can restore it if needed. Actually, it’s a good idea to back up the current version of any Android app before updating. I’ve been burned too many times by updates that were broken or had reduced functionality. 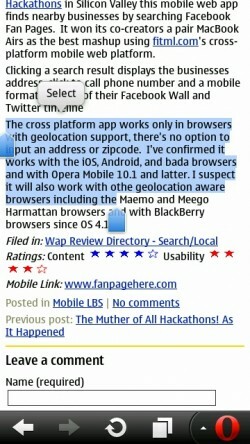 Except for CM7 users, both the the new Opera releases are highly recomended. The new text selection UI is a huge improvement on touch-only (no dPad or trackball) devices like the Nokia N8 and most recent Android phones. This entry was posted in Browsers and tagged Opera Mini, Opera Mobile by Dennis Bournique. Bookmark the permalink. I wants to download opera mini 6.1 for my mobile n5130xm,but everytime i’m downloading it shows an error msg ‘no gateway reply’ i thinks the link for downloading is not working well. Fire!!! On Nokia’s “No Gateway reply means that: there’s a network problem or you are trying to go to a non-existent URL. 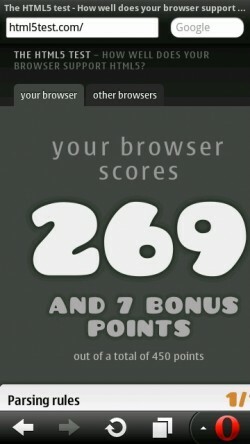 Download Opera Mini from http://m.opera.com with the built in browser. If you have working network connection the download should work. If it doesn’t there’s a problem with the connection and only your mobile operator can fix it. I removed the email addresses from your comment. Don’t post your email on the web, you’ll just get a bunch of spam. If you want replies emailed to you check the “Notify me of followup comments via e-mail” box on the comment form. 6300? I am currently sending this message with this outdated ancient Nokia phone. 6.1 keeps crashing on my device, showing out of memory. Annoying. Thanks, Dennis, as far as I’m concerned, it’s never official until. I hear from you. And though I gave a cursary glance to the om forum, I didn’t know the font issue was specific TO OM7,so thanks. Anyway, I started a new thread on that forum as regards 6.1 on android! Spelling errors. on my tiny device are common! How do i keep the old opera jusi in case ? On Android you can use any of the App Manager utilities in the Market that have a backup feature like ImApps, ES File Explorer or AppMonster. Hi Dennis,is there any emulator for nokia s40v5 (240×320). I don’t understand java so don’t recommend me sdk.I just want to play mobile game and take screenshot when I get a proudly highscore. 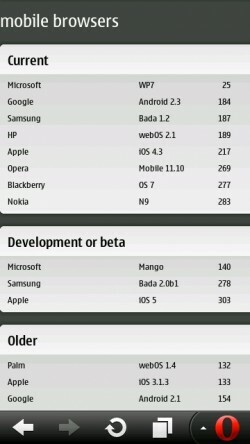 till now opera mini 6 have some problem with nokia s40. ex:some time page content are going hide,some time other tabs are show memory clear refresh again etc.